The day after the canonization Mass, Bishop Hubbard celebrated a Mass of Thanksgiving - with a highly-acclaimed homily, to be published in The Evangelist's next issue - with the diocesan pilgrims and about 1,800 Native Americans, all present at the Altar of the Chair of Peter in St. Peter's Basilica. Throughout the week of the diocesan pilgrimage, priests and deacons of the Albany Diocese served as eucharistic ministers and concelebrated at five Masses with the group. Revs. James Mackey, John Bradley and Robert Hohenstein, as well as Deacon Neil Hook, gave homilies. Charles Jones, director of music ministry at St. Pius X in Loudonville, played the organ at the Masses. Deacon Hook's most memorable moment of the pilgrimage occurred when he delivered a homily at St. John Lateran's Basilica. It's the "mother church of Rome. That's impressive to begin with," he said. "It was an honor to be asked to do that." His homily focused on the feast of the North American Martyrs, the 50th anniversary of the opening of the Second Vatican Council, the recent synod of bishops on evangelization and, of course, St. Kateri. The deacon has always been impressed by her and other saints' simplicity: "Their popularity grows and they become larger than life, but in their own lives, they were so happy and simple." 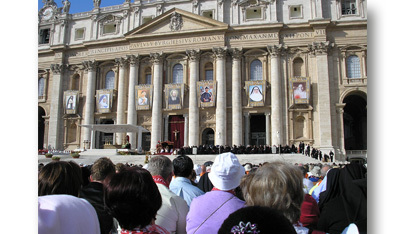 Jeffrey Marlett, a professor of religious studies at The College of Saint Rose in Albany, attended the diocesan pilgrimage to Rome with a unique perspective. He's a historian of American Catholicism and has given talks on St. Kateri Tekakwitha and St. Marianne Cope, both of whom were canonized during the trip. But it was still the simple things, like seeing groups of Americans, Germans, Spanish, Filipinos and others all gathered in St. Peter's Square, that affected him most. "To look around and just see people was very moving, above and beyond a connection to Kateri," he said. It was also special to see Native Americans "getting a place at the spiritual table." Dr. Marlett said by the time he got accustomed to the style of the canonization ceremony, it was nearly over - but when the new saints were invoked later on during the Mass, he knew it was official. He enjoyed hearing the Rosary and the people's responses uttered in Latin, as well as a prayer petition in the Mohawk language. Pope Benedict XVI even pronounced Kateri's name the Mohawk way: "Gah-dah-LEE." Dr. Marlett said the trip had "multiple levels of meaning" for him, since he met his wife while studying in Rome as a college student 23 years ago. He's since converted from the Presbyterian faith to Catholicism and moved from the Midwest to the Albany Diocese; his family attends Mater Christi parish in Albany. Dr. Marlett said St. Kateri is the perfect role model for young children because "she was bullied, [but] she stuck to her faith" and virginity. Charlotte Will of Gloversville says St. Kateri Tekakwitha brought her through a near-death experience a decade ago - so it was nearly tragic when she got separated from her spouse and her seat before the Mohawk maiden's canonization Mass in Rome last month. Luckily, she found her husband, Mark, 10 minutes into the ceremony in St. Peter's Square. "We stood there for five minutes just hugging each other," Mr. Will said, recalling his wife's cardiac arrest, which left her in a coma, on a ventilator and with failing kidneys. Doctors didn't expect her to live, but family members held vigils to St. Kateri in her hospital room for days. "After the third night, she started wiggling a toe" and eventually recovered, Mr. Will told The Evangelist. The couple, parishioners of Holy Spirit Church in Gloversville, even had a second child - named Bridget Kateri - against doctors' expectations. "There's no medical reason she should have lived through this." Mrs. Will, who lives with Addison's disease, an adrenal gland disorder, was "overjoyed" during the canonization Mass, which the Wills attended during a diocesan pilgrimage to Rome with more than 200 others. "It was incredible," said Mrs. Will. "I was crying so hard." Like other Albany Diocese pilgrims, the Wills saw Pope Benedict XVI up close. The Holy Father passed by about eight feet away: "I felt like you could reach out and touch him," Mrs. Will said. "The most touching moment for me [was] when someone behind me called out, 'Papa!'" For Gloria Bear, a parishioner of St. John the Baptist Church in Greenville, the Wills' reunion in St. Peter's Square after losing track of each other was memorable: "It was the most humbling, touching moment. It made you feel what love was all about." Mrs. Bear also enjoyed bus rides during the trip with Bishop Howard J. Hubbard, lighting candles in churches and chapels in Rome and Assisi, seeing the hilltop birthplace of St. Francis of Assisi and listening to the pope, even though she doesn't speak Italian. "It was like I understood what he was saying without being able to interpret it," she said. "You could feel it in your spirit. It will stay with me forever." Mrs. Bear said she made 200 friends and memories that "take your breath away." The canonization itself was a "culmination" of her connection to Native Americans; a retired teacher in the Greenville Central School District, she pioneered a curriculum devoted to the group for 25 years, incorporating visits from tribes all over the country into her classrooms. She also remembers trips to the National Shrine of the North American Martyrs in Auriesville as a child growing up in Schenectady. Being at the canonization "really pulled everything together," she said. Many pilgrims told The Evangelist that the eight-day trip overwhelmed them and brought them to tears at many points, transforming them into more patient, humble, faithful Catholics. Bishop Hubbard characterized it as a chance for spiritual renewal and an "opportunity to visit some of the most sacred places in Christendom. "It's been a long journey and certainly so many within our Diocese grew up learning the story of Kateri," Bishop Hubbard continued. The Albany Diocese submitted the formal petition for the saint's cause in 1884; she was declared venerable in 1943 and beatified in 1980. He was the presenter of her cause back then. "It was like a long hoped-for dream finally came to fulfillment," Bishop Hubbard said of the moment the Auriesville native became a saint. This was Bishop Hubbard's 18th visit to Rome as bishop. He expected to be seated with the other bishops in the audience at the Mass, but Cardinal Timothy Dolan, archbishop of New York, interceded about 10 minutes beforehand, clearing the way for the bishop to concelebrate with the pope. "I thought it was appropriate," given the Diocese's history with the saint, Bishop Hubbard said. "It was just awesome to stand at the papal altar and to look out at over 100,000 people gathered. It was really an extraordinary experience." The crowds certainly had an impact on Katherine Sharrow, a parishioner of St. Kateri Tekakwitha parish in Schenectady. Her husband is Deacon Thomas Sharrow. "It's overwhelming," she said. "It brings you to tears. It's just the love that's all there." Mrs. Sharrow and others said the trip involved a lot of uphill walking, a lot of waiting - the canonization ceremony involved about seven hours of standing in St. Peter's Square - and a lot of exhaustion. But it was worth it. "It was a dream come true," said Linda Green, a parishioner of St. Pius X Church in Loudonville, who traveled with her husband, Daniel. "To think that hundreds of years from now, kids will be studying the saints - and we were there." Mrs. Green has learned that St. Kateri's impact is "beyond belief" and that the simplicity of the saint's story "makes you believe that there really are saints in our midst, in everyday life." A retired tax worker, Mrs. Green befriended many foreigners. "That's probably what Kateri wanted," she remarked. "Everybody was there for the same reason. It made you learn more patience and just to enjoy and be in the moment. "I came back a more peaceful person," she continued. "We had a smile on our face the entire trip. We just felt so, so lucky." Eileen Skinner of St. Edward's parish in Clifton Park, a retired music teacher, was especially happy to "make joyful noises in [historic] churches, when most of the time, you have to whisper." Even though Mrs. Skinner tired of eating pork for days in a row and had a bad experience with a security guard confiscating her water bottle cap, she's thankful she went on the pilgrimage. "It's indescribable, really," she said. "I'm pinching myself: Was I really there?" Mrs. Bear agreed, comparing any tour group glitches to delivering a child: "It's painful, but you forget it because you have something beautiful under your arms." For the Wills, who had never traveled out of the country before this trip, the personal significance of it all was symbolized by two white doves they saw in a basket held by a statue of St. Francis. "I think there was a change inside me," said Mrs. Will, who grew up in Fultonville, visited the National Shrine of St. Kateri Tekakwitha in Fonda as a child and took Kateri as her confirmation name. "It's changed how I look at things and it's hopefully made me a better person."